Home→Cover Story→Ready to invest in a cleaner planet? Imagine a street sweeper that not only cleans your streets with a high-performance, heavy-duty sweeping system, but also does so with zero emissions. Global Environmental Products’ M4 ZE-Series does just that; in fact, it is North America’s first hydrogen fuel cell street sweeper and its only by-product is pure H2O. In addition to producing zero emissions, the Global M4 ZE Series is ultra quiet, extremely efficient and very powerful. Global Street Sweepers are purpose-built chassis that are designed from the ground up to be the ultimate sweeping machines. The Global M3 front steer, three-wheel sweeper is one of a kind. Safe, quiet and comfortable, the equal-width pickup broom and elevator system eliminates choke points and improves sweeping speeds while offering unparalleled performance. The M4 Series street sweeper utilizes the same equal-width pickup broom and elevator system, single engine design and short wheelbase. 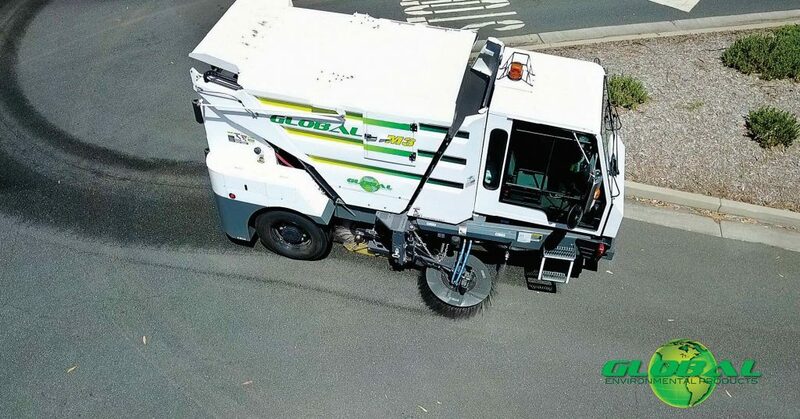 It is the only four-wheel mechanical sweeper that offers a 18-foot and 6-inches turning radius, 67 mph highway speeds and many standard features inherent to its purpose-built design that are not available on competitive street sweepers. Global Environmental Products has always been dedicated to building affordable, reliable and innovative sweepers. It is now focusing on protecting the planet as well. Global Environmental Products believes that the future of the street cleaning industry is providing equipment that not only cleans local streets, but also reduces our environmental impact and lowers emissions. Global Environmental Products will be displaying its M4 ZE Series street sweeper at the 2018 PWX, Aug. 2629, in the Kansas City Convention Center. Swing by booth 2,013 to learn how the M4 ZE Series street sweeper can clean your city while exhausting zero emissions. Compressed natural gas, or CNG, is natural gas under pressure that remains clear, odorless and noncorrosive. Although vehicles can use natural gas as either a liquid or a gas, most vehicles use the gaseous form compressed to pressures above 3,100 pounds per square inch. It is produced both worldwide and domestically at a relatively low cost and is cleaner burning than gasoline or diesel fuel. Natural gas vehicles show an average reduction in ozone-forming emissions of 80 percent compared to gasoline vehicles. The Global M4 Series is available as a side or rear hopper discharge. The design provides a turning radius of 18 feet and 6 inches. The CNG upgrade doesn’t affect the turning radius. The M4 CNG is the most maneuverable sweeper in the market, helping operators get into tight corners and cul-de-sacs. The 8.9-liter ISL G uses stoichiometric cooled exhaust gas recirculation, or SEGR, combustion, leveraging Cummins’ proven EGR technology to create a high-performance natural gas engine. “The best part is that the ISL G does not require active after treatment, such as a diesel particulate filter or selective catalytic reduction,” according to Walter Pusic, CEO and president of Global Environmental Products Inc. 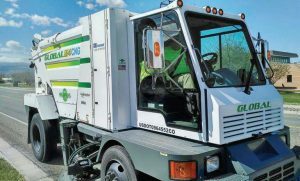 Global Environmental Products is proud to offer the CNG option on its Global M3 CNG three-wheel sweeper, Global M4 Series purpose-built street sweepers and Global V6Air “air-recirculating” sweeper with VAST Technology. Unfortunately, not all municipalities have access to CNG fueling stations; and to push forward with green, innovative technology and partnerships, the Global sweeper lineup now includes Electric Drive Street Sweepers. The M4 Diesel Electric Hybrid sweeper offers the same exceptional visibility, turning radius and low center of gravity, but uses an electric drive motor in lieu of a hydraulic drive system. With the diesel engine driving a generator that charges the batteries, the M4 electric-hybrid street sweeper offers fuel economy of 1.5 gallons per hour. With reduced carbon and NOX emissions of 58 percent and an additional 55 percent fuel savings over standard diesel-powered sweepers, the electric hybrid sweepers are a way of the future. Global Environmental Products has done just that with its electric hybrid street sweeper, which is the first hydrogen fuel electric street sweeper in North America. A hydrogen fuel cell system produces electricity from compressed hydrogen gas in a thermo-chemical process, then uses the electricity to power an electric system and motors that drive the vehicle. The fuel cell and hydrogen tank take the place of a battery-electric vehicle’s bulky and heavy battery pack. The diesel engine is no longer required. The by-product of electro-chemical reaction is energy and H2O. The water produced through this chemical reaction is diverted to the sweeper’s water tank system, providing an additional 43 gallons of water per shift to use for dust suppression. fuel efficiency with zero tailpipe emissions. Ask yourself one question: Am I ready to embrace the “green initiative” and invest in reliable and innovative equipment that truly makes a difference? 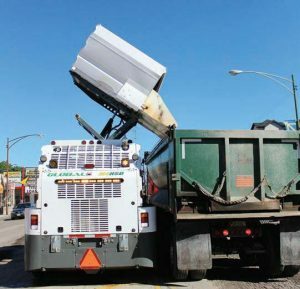 California Department of Transportation utilizes 170-plus street sweepers daily. Each M4 ZE produces 43 gallons of water per shift so that equals 7,310 gallons of water produced by operating street sweepers. Become a Global Environmental Products’ partner and help save the planet. Learn more at www.globalsweeper.com, or call (909) 713-1600 and email info@globalsweeper.com.